There is nothing as romantic as a beach wedding and Oman’s beaches are famous for being clean and pristine. When the setting is perfect, all you need is a beautiful Bride and Groom and lovingguests to complete the picture. Muscat Hills Resort had one of those perfect weddings recently when they hosted the wedding of newly weds Jen and Phil. 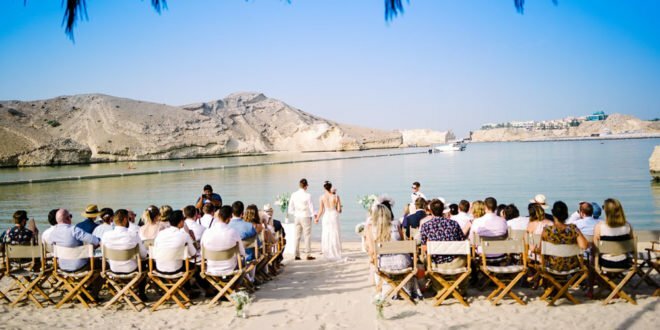 Jen and Phil, both from the U.K., chose Oman as their wedding destination after relocating less than two years ago. It was a perfect day for a wedding and the setting was just about as romantic as it comes. The bride wore a breathtaking lace bridal gown, the decor was hand made – each piece with a personal touch. Bride and Groom spoke to this beautiful couple about their journey to this special day. Go ahead and fall in love with their story. The reason for choosing Muscat for your wedding destination? We loved the idea of a destination wedding and the benefit of marrying in the Middle East is that you’re almost guaranteed to have sunshine! We wanted to make it a holiday event for all of our friends so we could show them all of the amazing things Oman has to offer. It was a way of celebrating our new life in Oman with all of our friends and family. Reason for choosing Muscat hills resort? The setting is a paradise with a beautiful contrast between the beach and mountains. The feeling was that of a tropical beach away from the busy city, which was perfect as we wanted a relaxed, private atmosphere. Throughout the whole planning and preparation experience the staff at Muscat Hills Resort made everything very easy for us and made it very personal. What is your favourite feature about Muscat Hills Resort? We loved the chilled out, chic beach club vibe – the atmosphere, music and lighting. Also, the accommodation is incredible! The contrasting rustic beach huts gave the impression of being immersed in Arabian nature, with a touch of luxury. Being eco-friendly and having everything sourced locally was also an attractive quality. Any interesting proposal story to share with the readers? Philip had already been living in Muscat for a few months when we got engaged and I was still working as a midwife in Newcastle, England. After he had moved out to Muscat he contacted my sister and asked for her help in designing an engagement ring by a jewellery designer in Leeds – Phillip Stoner. Fast forward a few months to Christmas. Phil was unsure whether he would make it home due to work commitments. It was the evening of December 23rd and Phil called to say “I’m coming home! Meet me at Heathrow tomorrow at midday”. It was a very last minute trip and knew it would only be for a few days so as soon as I got home from work I packed and prepared to set off for London early the next morning. Little did I know that Phil had already made a call to my dad to ask his permission to marry me and had set the wheels in motion! As you can imagine Christmas Eve traffic was manic and although I set off at 6am I didn’t make it to Heathrow in time to meet Phil in arrivals! He had been waiting with a coffee for almost 30 minutes by the time I arrived. We made our way to Henley-on-Thames where we were staying with Phil’s parents. The rest of the day was spent relaxing and catching up with family. It was the following morning, on Christmas day that the proposal happened. Phil had planned an early morning walk along the Thames before we set off to spend the day at his brother’s house. Unfortunately this didn’t happen! Phil had to change his plans and it was when we were in the flat getting ready for the day that he surprised me. It was just the two of us and we had one of my favourite old movies on in the background – On The Town, starring Gene Kelly and Frank Sinatra – and Phil came in and spun me round. I thought he was going to dance with me but he got down on one knee and popped the question! I wasn’t expecting it at all and couldn’t believe it. Obviously I said yes and we both started crying. I had to remove my just-finished makeup which was now running down my cheeks! From Henley we made our way over to Wimbledon to announce our engagement and spent the rest of the day celebrating with the family. It was an unforgettable Christmas. One of the best parts of the wedding was that Phil’s best man, Larry, conducted the ceremony for us. He and his wife live in Melbourne and it meant the world to us that he flew all the way to Muscat to be such an important part of our day. The whole day was absolutely perfect. It couldn’t have gone more smoothly, all thanks to the staff at Muscat Hills. From the drinks reception, to the ceremony, the meal and finally the evening party, everything went according to plan. The food was outstanding and was delivered in abundance! Each and every guest commented on the exceptional quality of their meal. The dinner was followed by dancing on the beach and the band were fantastic. They played a selection of requested songs that all had some special meaning to us and it got everyone up on the dance floor! It was brilliant seeing all of our guests having such an amazing time. The dress was called ‘Phoebe’ made by designer Maggie Sottero. This was not the dress I thought I would ever go for! It was so different to all of the other dresses I’d tried on initially, it was a completely different style to what I thought I wanted. I had gone to York for the weekend with my mum and sister to visit a few dress shops. It was at the first appointment of the day with a lovely lady called Mary, who owned the Bridal shop Elizabeth of York, that I found the dress. I tried on a few different designs but as soon as I tried on the Phoebe I just loved it and I knew. I bought it then and there and cancelled the rest of our appointments for the day! Philip and I wanted to make the day as personal as possible. All of the décor was handcrafted with help of friends and family over the weeks leading up to the wedding day. We had a mix of themes but wanted to keep it simple and rustic and loved coming up with ideas to keep it personal to both of us. Phil and I have both traveled and lived abroad in many countries so that was one of the themes too. Each table name was of a city where we have lived and our wedding logo was designed around an airport stamp to tie in with the destination wedding. My mum used to be a florist so she was in her element creating wonderful centre pieces for the tables and even made my bouquet. We were able to source some Scottish sea holly to incorporate in to the bouquet and the groomsmen’s buttonholes to keep with Phil’s Scottish roots, which was a really lovely touch. Creating it all ourselves made it so special.